In this article, we will update new information and discuss Prolotherapy knee osteoarthritis injections. The knee is the most common joint treated with Prolotherapy at Caring Medical. We use a comprehensive Prolotherapy approach that stimulates the natural repair of connective tissue. Prolotherapy research shows significant improvement in selected patients with knee osteoarthritis. Treating the whole knee joint as opposed to selective parts of the knee is more effective in alleviating knee pain and healing the damage. and in general causes destructive hypertrophy (enlargement or swelling) of the knee joint capsule. Comprehensive Prolotherapy can address all these issues simultaneously and spontaneously (it starts working immediately). Let’s get to the research. Prolotherapy is a remarkable treatment in its simplicity. The treatment can help many patients avoid joint replacement. But it is not a miracle cure. The research and evidence for how Prolotherapy may help you is presented here and intermingled with out own 26+ years of empirical observation of patient benefit. How does Prolotherapy work in your knees? chondrocytes – A chondrocyte is a cell that makes cartilage. In the human body, the chondrocyte is the only cell type in cartilage. Your entire cartilage is a wall of chondrocystes. We have a fascinating article The Extracellular matrix (ECM) | How comprehensive prolotherapy repairs cartilage on this website if you would like to research that more. Simply put, that is how Prolotherapy works. It rebuilds damaged soft tissue. We will now present the research that answers many questions about treatment success and realistic outcomes. Patients received up to six prolotherapy sessions. Primary question the researchers wanted to answer: Patient satisfaction with three or more prolotherapy sessions. Secondary: Scoring assessment for improvement in function ability to get out of a chair, increase in walking ability, increase in ability to climb stairs. More of Dr. Rabago’s research is cited in this article as well as our own Caring Medical published findings. In October 2017, a team of researchers from Shahid Beheshti University of Medical Sciences, Tehran, Iran published their findings in the Middle East Journal of Family Medicine (4) in which they found significant pain relief after Prolotherapy injections in patients suffering from knee osteoarthritis. The purpose of this study was to investigate the effect of dextrose injection on pain control associated with knee osteoarthritis. The findings showed that injection of 15% and 25% of dextrose Prolotherapy had a significant effect on the visual (scoring scales) of pain and function of patients so that during treatment, (scoring scales) scales showed improvement in treatment in these patients. Also, other findings showed that injection of 25% dextrose Prolotherapy compared to 15% had a significant effect on visual scale of pain and function of patients. The study was a single-blind clinical trial. (The patients did not know they were getting Prolotherapy). 80 knee osteoarthritis patients referred to Taleghani Hospital in Iran. Randomly divided into two groups: 15% dextrose injection and injection of hypertonic dextrose 25%. the group of 25% Dextrose injection experienced more pain relief than the 15% group. However, even a 10% solution, significant results could be achieved. According to the results, it can be concluded that the mechanism of the effect of Dextrose Prolotherapy is direct effects, osmotic (growth in the number of cells) and inflammatory growth. Dextrose injection with a concentration of less than 10% still directly promotes cell and tissue proliferation without inflammatory reaction and a high concentration of 10% results in an extracellular osmotic gradient at the injection site resulting in loss of intracellular and lyse cellular cells (a breakdown of damaged cells) and the beneficial invasion of growth factors and inflammatory cells that start the wound healing cascade in that particular area. In research from June 2017, doctors publishing in the British Medical Bulletin (5) reviewed and evaluated Prolotherapy findings and determined Prolotherapy treatments for patients with knee osteoarthritis showed significant improvement in scores for pain, function, and range of motion, both in the short term and long term. Patient satisfaction was also high in these patients (82%). In this study they took 24 female patients with an average age of 58 (the youngest being 46 the oldest 70) and gave them three monthly Prolotherapy injections. At the end of week 24 of the study, knee range of motion increased, pain severity in rest and activity decreased. Improvements of all parameters were considerable until week 8, and were maintained throughout the study period. 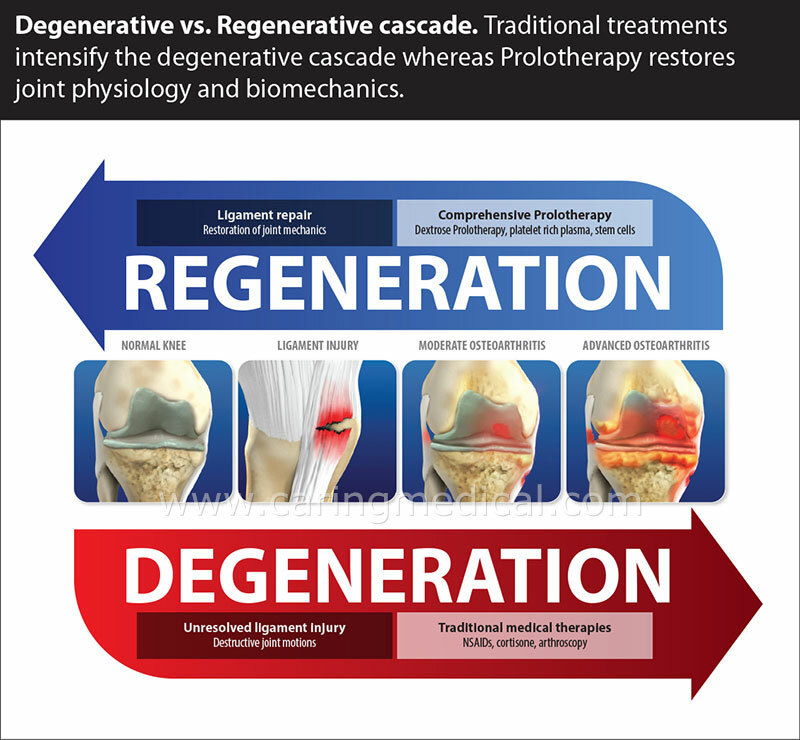 In April 2016, A multinational team representing university researchers in Argentina and Dr. Dean Reeves from the University of Kansas Medical Center, Dr. J Johnson Michigan State University and Dr Rabago from the University of Wisconsin, School of Medicine and Public Health researchers confirmed that Prolotherapy could regrow articular cartilage in the knee in a study of patients with an average age of 71 seventy-one. (10) More on this study appears below. Dextrose injection is reported to improve knee osteoarthritis −related clinical outcomes, but its effect on articular cartilage is unknown. A chondrogenic effect of dextrose injection has been proposed. This study assessed biological and clinical effects of intra-articular hypertonic dextrose injections (prolotherapy) in painful knee osteoarthritis. The study design was case series with blinded arthroscopic evaluation before and after treatment. Symptomatic knee osteoarthritis for at least 6 months, arthroscopy-confirmed medial compartment exposed subchondral bone (a bone on bone situation), and temporary pain relief with intra-articular lidocaine injection. Four to 6 monthly 10-mL intra-articular injections with 12.5% dextrose. Six participants (1 female and 5 male) with median age of 71 years, and average pain duration of 9-years. WOMAC (Western Ontario and McMaster Universities Osteoarthritis Index) a pain measurement scoring system) composite score of 57.5 points, signifying problems with pain, stiffness, and function. Patients received an average of 6 dextrose injections and follow-up arthroscopy at 7.75 months (range 4.5-9.5 months) – to measure the effectiveness of treatment. Posttreatment showed cartilage growth compared with the pretreatment. Biopsy specimens showed metabolically active cartilage with variable cellular organization, fiber parallelism, and cartilage typing patterns consistent with fibro- and hyaline-like cartilage. Compared with baseline status, the median WOMAC score improved 13 points. Positive clinical and chondrogenic (cartilage growth) effects were seen after prolotherapy with hypertonic dextrose injection in participants with symptomatic grade IV Knee Osteoarthritis, suggesting disease-modifying effects and the need for confirmation in controlled studies. Minimally invasive arthroscopy (single-compartment, single-portal) enabled collection of robust intra-articular data. This suggested a disease-modifying effect or a “reversal” of the disease progression. In published research in the Journal of Prolotherapy, (13) Ross Hauser MD investigated the outcomes of patients receiving Prolotherapy treatment for unresolved, difficult to treat knee pain at a charity clinic in Illinois. 80 patients, representing a total of 119 knees, that were treated quarterly with Prolotherapy. The results of this study showed that patients had a statistically significant decline in their level of pain, stiffness, crunching sensation, and improvement in their range of motion with Prolotherapy. More than 82% showed improvements in walking ability, medication usage, athletic ability, anxiety, depression, and overall disability with Prolotherapy. Ninety-six percent of patients felt Prolotherapy improved their life overall. Has Prolotherapy changed your life for the better? 96% of patients treated answered yes. 43% felt their life was at least radically better with Prolotherapy. 88% rated Prolotherapy at least very successful in treating their condition (50% or greater improvement) with 50% noting the Prolotherapy to be extremely successful (75% or greater improvement). The percentage of patients able to decrease their additional pain-related treatments including chiropractic, physical therapy, acupuncture, and massage after Prolotherapy was 86%. The percentage of patients able to decrease their medication usage by 50% or more was 90%. The patients in this study were treated four to six years prior to the publishing of this paper. Eighty-seven percent noted that the results of Prolotherapy have mostly continued (at least 50% retained), and 52% of patients noted that their overall results have very much continued to the present (75% to 99%). Seventy-eight percent noted there were reasons besides the Prolotherapy effect wearing off that were causing their continued pain and/or disability. 15% had other explanations for the pain. Of the patients whose pain recurred after Prolotherapy was stopped, 81% are planning on receiving more Prolotherapy. Prolotherapy used on patients who had a duration of five years of unresolved knee pain was shown in this observational study to improve their quality of life. improved ability to work and activities of daily living. Therefore, Prolotherapy appears to be a viable treatment option for people suffering from unresolved knee pain. Ignoring the patient’s other pain sources including joint-surrounding tendons and ligaments could be another potential cause of treatment failure; (in the study) we did not treat enthesopathies or the ligament fibro-osseous junctions with extra-articular dextrose injections around these elements in our study. So, it appears that ligaments or other structures need to be treated to get the full benefit from prolotherapy. Doctors writing in the Journal of Pain Research (14)have published research supporting what we have known here for decades. To most effectively treat knee osteoarthritis with Prolotherapy, Platelet Rich Plasma, or Stem Cells, you must treat the whole knee and not simply the cartilage degeneration. In this study, doctors from the University of Tehran compared results in patients who received Prolotherapy with dextrose periarticular injections around the knee joint with patients who received Prolotherapy intra-articular injections. In other words, one group received injections around the knee joint, another group received injections directly into the knee joint. Both peri- and intra-articular prolotherapy patients showed reduced pain and disability of their knee osteoarthritis after 5 months of follow-up. Interestingly, periarticular prolotherapy had better effects on pain scores and disability scores in some respects. Periarticular Prolotherapy injections showed superior effects on healing of knee disability and pain score compared with intra-articular injections. Pain score was significantly lower at 1-, 2-, 3-, 4-, and 5-month visits in the periarticular group compared with the intra-articular group. Periarticular injections can significantly reduce the requirements for patient-controlled analgesia and can improve patient satisfaction following total knee replacement. Periarticular injection showed adjuvant effects to intra-articular prolotherapy. The researchers found periarticular Prolotherapy showed healing effects in many aspects of knee function that were better than with intra-articular prolotherapy. This healing effect was observed particularly in active movements, including walking on flat surfaces and ascending and descending stairs. Simply, Prolotherapy for knee osteoarthritis is not a single or few injections, it is many injections. In more difficult cases we may introduce Platelet Rich Plasma and for cases where warranted Stem Cells and/or a combination of therapy. If we get to a situation where we decide to use stem cell therapy, we augment this treatment with Prolotherapy, PRP, and sometimes a combination treatment using bone marrow stem cells. If you have questions and would like to discuss your knee pain issues with our staff you get get help and information from our Caring Medical staff.